It’s fair to say Dean Henderson has impressed between the sticks since making the switch from Manchester to Sheffield. 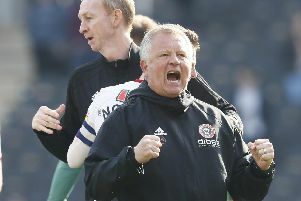 The England Under-21 international joined Chris Wilder’s side on a season-long loan in June after impressing at Shrewsbury Town the previous campaign. Since making the switch, Henderson has gone on to put in a string of match-winning performances with some incredible saves thrown in. And the 21-year-old has become a big fans’ favourite at Bramall Lane with the club launching their own ‘Deano Cam’ tracking his saves and his celebrations. But, it’s clear that Henderson still sees his long-term future at Old Trafford, especially if his latest tweet is anything to go by. Henderson has the tough task of forcing his way past David De Gea if he wants to become Manchester United’s number one. Despite boasting just two Premier League clean sheets this season and conceding 23 goals, De Gea has enjoyed another fine season. The Spain international is reportedly close to signing a contract extension at Old Trafford but Henderson is still eager for an Old Trafford opportunity. Although it’s clear Henderson is fighting for his Old Trafford future, most Blades fans are keen for him to make his season-long loan move a permanent one.